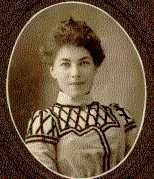 Olive E. (Delmage) Hawley was born on the family farm near Newburgh, Ontario in May, 1878. She grew up in a very Victorian and Christian environment with her sisters Alice, Helen, Edith, Julia and Geneva, and her brother Joseph. Her childhood and early teen years were tranquil, marred only by Joseph's death (aged 8) in 1895. Olive met George E. Hawley (1875-1966), a farmboy from North Addington Township, when he worked as a hired man on the Delmage farm. 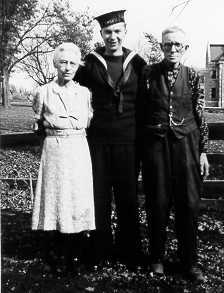 They were married in 1904 and their son Howard was born in 1908. After her father's death in 1910, and the consequent end to the family farm business, George and Olive moved to Scarborough (near Toronto) where Grandpa Hawley ran a cartage business for a number of years.Their son George Rockwell (Rocky )was born 1n 1914, and their daughter Mary was born in 1916. In 1930,at the start of the Depression the Hawley family moved to the small town of Deseronto, near Kingston Ontario. The poverty of the Depression years were hard on Olive's health, as she had suffered a serious lung problem in the 1920s. Nevertheless she lived through World War II and after raising 3 children and seeing one grandson born she died in August 1951 at the age of 73. Oh my, what a difference 100 years makes! If you or I were starting a scrapbook now, at the close of the 20th century, we'd hop in the car, drive over to Wal-Mart , buy a brand new book, and start pasting in our stuff. We might even download articles from the Web to include in it. Alas, no such luxuries were available to young Olive Delmage when she started her book in the early 1890s. Even if she had the money for a new book, it was a three hour drive to the nearest town by horse and buggy to buy it. So she recycled her scrapbook, or as she would have said: "made do with what was at hand." Grandma's scrapbook started life as a prestigious legislative volume: "The Sessional Papers of Upper and Lower Canada, No.3; Victoria 30, 1867." It originally belonged to Mr. John Martin, who is lost in the mists of the past - he was likely related to Olive's Aunt Estella (Martin) Price. For nearly 50 years my grandmother laboriously covered the pages of this dignified old lawbook with hundreds of newspaper articles, obituary notices, recipes, and words of wisdom from the countless almanacs that found their way into her hands. She never failed to find something to keep. Of course she had more time as a youngster and as a mother of grown children, so there's plenty of stuff from the 1890s and the 1930s and 40s, but not as much around World War I. The scrapbook stayed with her sons after Grandma Hawley's death in 1951, and after they passed away in the 1980s, Rocky's wife (Aunt Evelyn) kept it until late last year. Aunt Evelyn then handed it on to my mother, the last of Olive's children, and in December 1998, the book came home with me. The articles in the scrapbook give a unique look into the thoughts of a very Victorian lady and her times, so enjoy what's here. Disclaimer: I may be violating someone's copyright with this material, but as most of it is close to 100 years old, I'm sure nobody will mind if it appears on the Web. Enjoy! and is not treasured for its worldly worth. Its value is a fact apart from earth. since they brought strength of soul and heart's content. are all recorded here, and deeeply prized. found in an empty attic, dusty with old dreams. for all my heart is here for you to see. My grandfather knew this by heart in his 80s. I think it was his favourite poem. I am brimming with mischief and frolic and glee. And you'd think such a boy never cares for a thing. Their thoughts can go deeper than some people deem. And each has his feelings, though only a boy. But how shall I manage? Can anyone say? If I start for a stroll, it is "Keep off the street!" If I go to the house it is "Mercy! What feet!" If I take a seat, 'tis "Here! Give me that chair!" If I lounge by the window, 'tis "Don't loiter there!." If I ask a few questions 'tis "Don't bother me!" Or else: "Such a torment I never did see!." Till I think in this wide world there's no place for boys. And most any boy, too, will say just the same. But we try to do right, just as hard as we can. For the best man on earth, once was "only a boy." I wonder what the Ontario Education Improvement Commission would have to say about this? As if we had rulers instead of a spine! When the teacher gets cross and the dimples goes in. And the ones and the sevens begin playing tricks. Where the cry babies cry all their slates up in tears. As if he and the lesson were running a race! The tables gets straight and the readers gets right. When the teacher gets good and the dimples comes out. The story of Helen Keller's life is the biography of two wonderful women- the blind, deaf,and dumb girl who for over twenty years has fought against awful odds, and the kind, ingenious and patient teacher who has led her charge into the sunlight of knowledge and of kinship with humanity. In 1886, when Miss Annie Sullivan was called to Tuscumbia, Ala., to assume the care of Helen, the child had been living for nearly five years in the mental darkness that followed her treble affliction resulting from convulsions.The task of education seemed well nigh hopeless, for the one sense through which the child's mind was to be awakened to consciousness was her sense of touch. But in June 1904, eighteen years later, Miss Keller graduated from Radcliffe with distinction, and received her degree of B.A. This fairy tale of education, this romance of the conquest of obstacles, is a superb triumph of concentration. At her entrance examination in June 1900, as if Nature had not sufficiently handicapped her efforts, she had to submit to two additional trials. The questions were given her in the American Braille system of writing for the blind, with which Miss Keller was only slightly familiar, having learned the English Braille - the two systems being as different as two distinct systems of shorthand. This delay in puzzling out the translation of the questions was further aggravated by the fact that her little Swiss watch with raised figures had unfortunately been left at home, so she had no means of gauging the time, yet her typewriter clicked out the answers and she "passed" with flying colours in every study. During her college course, in many studies Miss Sullivan repeated the lesson while Helen's fragile fingers feathering the way over her mentor's face, translated the muscular motions of speech into ideas. She studied English, Latin, French, Greek, German, political economy, logic, higher mathematics, chemistry and all the other myriad phases of college wisdom, through her wonderful fingers. She uses the typewriter in five languages, has learned to speak with clear articulation, can swim, row, play cards, chess and basketball; dance and perform a hundred other seemingly impossible things. Her memory is marvellous, her temperament sunshiny and happy; her mind is wonderfully broad, subtle and thorough, and her book, "The Story of My Life," besides being great as a biography, is the most important work of the century on psychology as a revelation of the human mind, its methods and possibilities. My Grandpa Hawley told me lots of stories about his days as a carter in Scarborough. But I wonder why he never mentioned this? Birch Cliff, Mar 3, 1916. A collision between a York radial car and a horse belonging to Postmaster A. H. Mitchell, at eight o clock this morning between Stops 19 and 20, resulted in the horse being killed and the front of the car badly smashed. The horse, yoked to a sleigh, was being driven by George E. Hawley. It had just left Mr. Mitchell's yard and was crossing the tracks when the driver noticed the car rounding the curve a short distance away. He raised his hand but was not seen. As the car bore down on him, he jumped. The car missed him by about a foot and struck the horse broadside. The animal was hurled about 115 feet. It died as it was being led to the stable. The vestibule was badly smashed up, and the car had to be sent to the barn. The horse was valued at $150. Gossip about their friends for all they're worth. And that one wanted sugar on her bread. The happy moments of life's golden spring. The old and lonely mothers of us all. The lovely guardians of a kindlier day.